Called Tinkerbox, the residence is located in Kerhonkson, a hamlet situated about 100 miles (160 kilometres) north of Manhattan. The two-storey black home was envisioned as a getaway for a car enthusiast. The upper level contains the main living zones, while the lower level encompasses a garage and workshop. The exterior is sheathed in charred cedar, which was burned using the Japanese technique of Shou Sugi Ban. The architects singed the wood themselves, giving them a chance to participate in the building process. “We researched the Japanese technique of charring wood called and decided that it was something we wanted to tackle on our own,” the studio said. 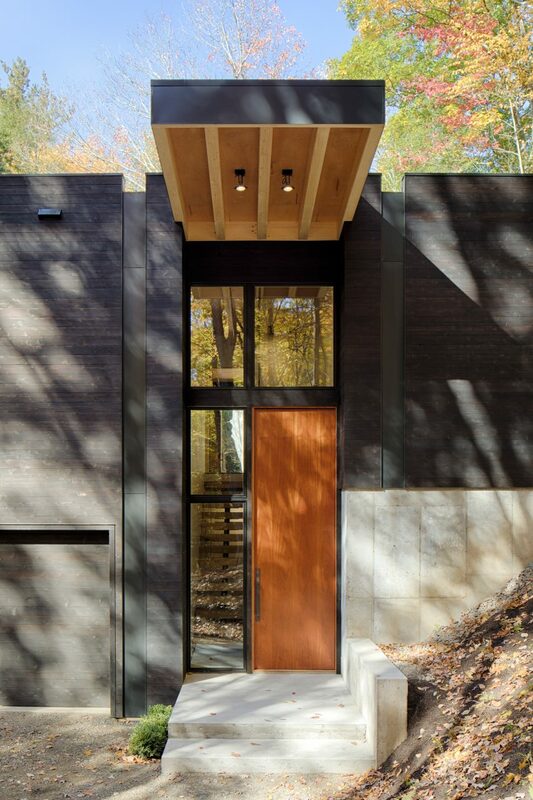 Upon approaching the house, visitors encounter a mahogany pivot door that rises 12 feet (3.6 metres). 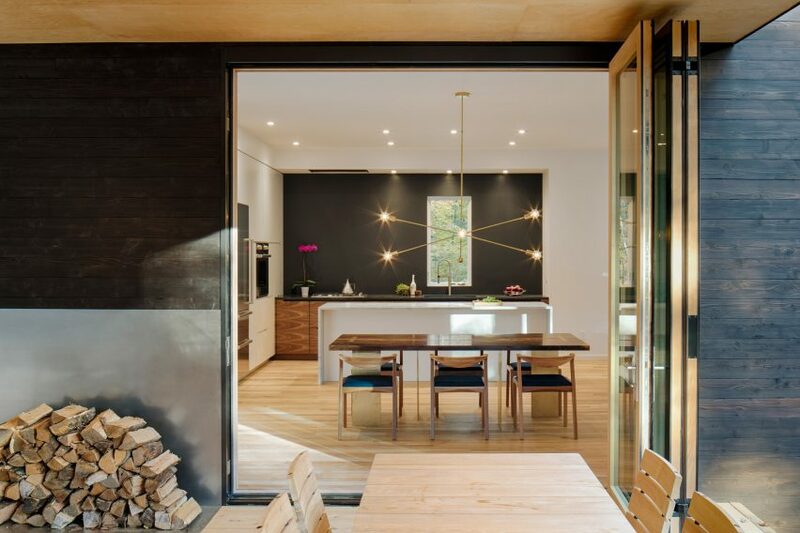 A wooden canopy cantilevers over the entryway and is meant to direct the eye upward. “The continuous wood beam structure of the cantilever pulls the eye up and through the space,” the architects said. The same strategy was used in the rear of the cabin, where a large wooden plane shelters an exterior deck. The plywood canopy is supported by single beam anchored to a concrete column that doubles as an outdoor fireplace. Inside, the home’s upper floor contains a master bedroom on one side, and an open-plan living and dining area on the other. The zones are separated by a stair that leads down to the lower level. The stair treads were fabricated using hardwood trees culled from the site. 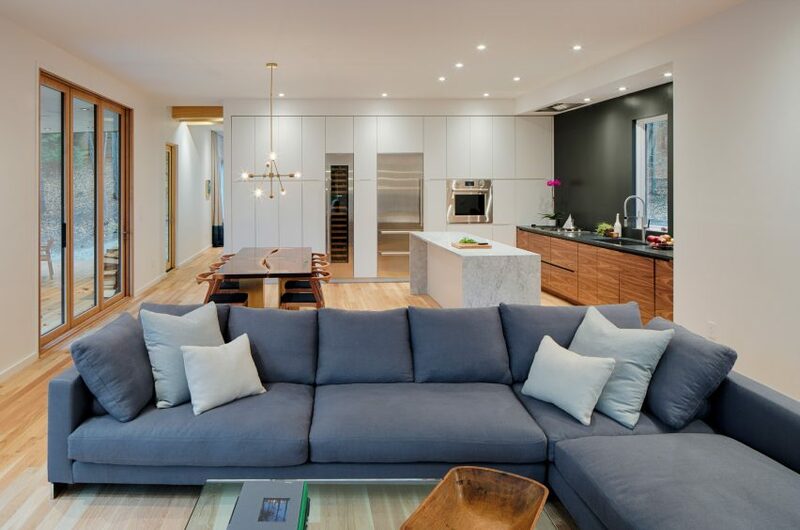 The team sought to incorporate a “handcrafted concept” throughout the dwelling. 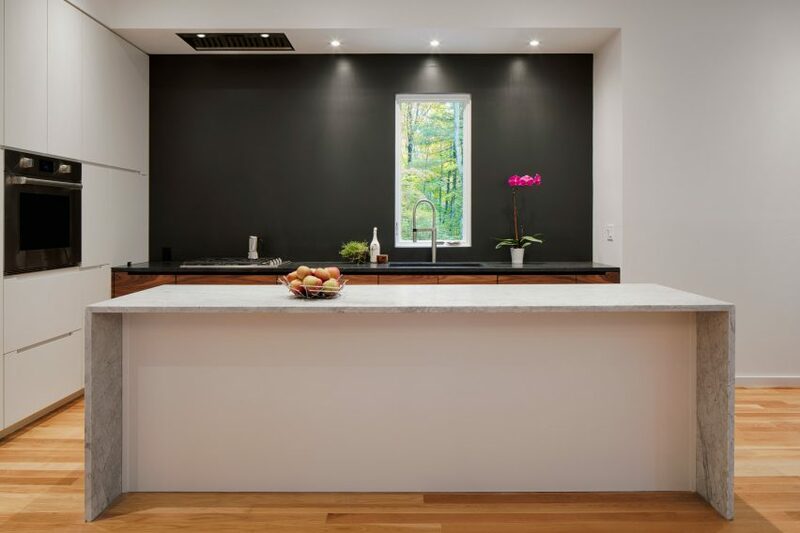 A waterfall-edge marble island sits between the kitchen and dining area. The dining room table was designed by Studio MM and built by the craftsman Elijah Leed. The firm also designed the brass chandelier suspended over the table. “This house is all about curating specific and unique design moments,” the architects said. 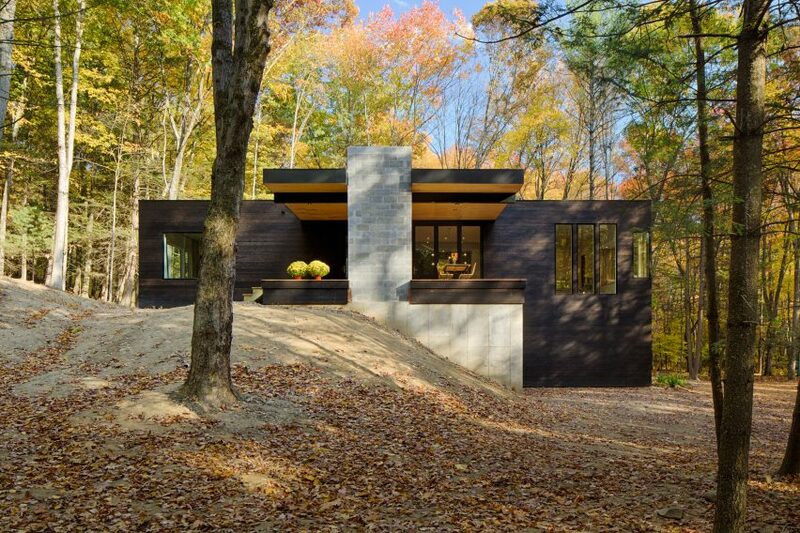 Other homes in the Hudson Valley include a wooden retreat by Foz Design that is perched on a sloped site overlooking a river and a rectilinear dwelling by Jay Bargmann with glass walls that reflect the scenic landscape.